Huntington’s disease (HD) is a neurodegenerative disease where GABAergic medium spiny neurons (MSNs) in the striatum degenerate. Embryonic stem cell-derived neural transplantation may provide an appropriate therapy for HD. Here we aimed to develop a suitable protocol to obtain a high percentage of functional GABAergic neurons from mouse embryonic stem cells (mESCs), and then tested their differentiation potential in vivo. The monolayer method was compared with the embryoid body and five stage method for its efficiency in generating GABAergic neurons from mESCs. All three methods yielded a similar percentage of GABAergic neurons from mESCs. Monolayer method-derived GABAergic neurons expressed the MSN marker dopamine- and cyclic AMP-regulated phosphoprotein (DARPP32). 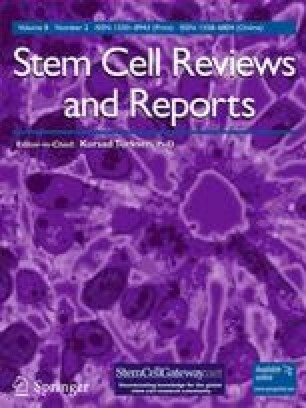 The pluripotent stem cell population could be eliminated in vitro by treating cells with puromycin and retinoic acid. Using patch-clamp recordings, the functional properties of GABAergic neurons derived from mESCs were compared to GABAergic neurons derived from primary lateral ganglionic eminence. Both types of neurons showed active membrane properties (voltage-gated Na+ and K+ currents, Na+-dependent action potentials, and spontaneous postsynaptic currents) and possessed functional glutamatergic receptors and transporters. mESC-derived neural progenitors were transplanted into a mouse model of HD. Grafted cells differentiated to mature neurons expressing glutamate decarboxylase, dopamine type 1 receptors, and DARPP32. Also, neural precursors and dividing populations were found in the grafts. In summary, mESCs are able to differentiate efficiently into functional GABAergic neurons using defined in vitro conditions, and these survive and differentiate following grafting to a mouse model of HD. We wish to thank Dr. Hugh Hemmings for the generous gift of the DARPP32 antibody. This research was supported by funding from Keele Medical School, Keele University, UK.